1. 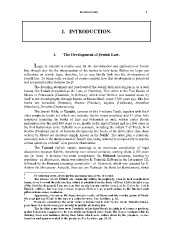 The Development of Jewish Law. and conceived within Judaism itself. certain questions of detail or to provide illustrations. followed by the Gemara (meaning, completion - pl. Gemarot), which was redacted by R.
3 Or believing Jews, if you prefer; and many non-Jews, of course. Apparently, not only at Mt. Sinai, but also earlier at Marah and later on the plains of Moab. We shall just say 'Sinai', in the way of a collective term. See Lewittes, p. 38.
sometimes it is used even more broadly to include all Jewish law. forgotten and again revealed to the prophets. See Lewittes, pp. 32-33.